I believe Jesus died to pull us back into the pages of God’s original story for us. God gives us the freedom to do as we please with the story. We can cross out the parts we don’t like. We can rip out all the pages and burn them. Or we can make ourselves the main character, which is what I do sometimes. In my selfishness, I begin to think that I can write the book on my own. Oh sure it’s easy to give God a good mention in the introduction and include Him in a few chapter headings: College, Career, Marriage. And when things get tough, I’m always ready to hand back the torn pages upon which I’ve scribbled, hoping that God will magically smooth out my papers and return them to me, a fresh clean slate. And toward the end of the story? When people realize there aren’t many pages left in the book? Suddenly there is a sense of urgency to include God in every chapter. We want to add a whole addendum with footnotes reaching back to the pages where we used to edit Him out of our lives. What I don’t always remember is that God already knows the book by heart. chapter and verse. So after years of writing God out of the story, He chose to save us from the disastrous ending we were writing for ourselves. It was then that He introduced the true Author, Jesus Christ. The story arc of the New Covenant between God and His people that would allow for a deep, intimate relationship with the Father. Never to be separated from God, forever and ever amen. Surely this must be fiction. If the first part of the story was written with chisels and stone, Jesus’ entry brought out the neon Sharpies, and the beautiful blue India ink. His chapters didn’t just give us a to-DON’T list, but a real and active to-DO list. Be loving and generous. Holy and selfless. Serve. Forgive. Evangelize. Love others not only the way we love ourselves but the way Jesus loves us. Yup, even the people we can’t stand. And then all too soon, He seems to take Himself out of the story. Jesus dies. I know what I would’ve thought. Are you kidding me? How can it just end like this? Surely there has to be more. And of course three days later, in the mystery of the Trinity, we learned that the story wasn’t over, it was just beginning. 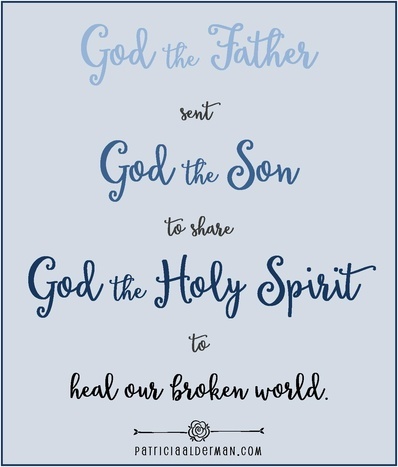 God the Father had sent God the Son to share God the Holy Spirit. To heal our broken world. Still, I’m a big fan of “Why?” Why did Jesus die? I believe that He died to heal and restore our broken relationship with God. So that, by the power of the Holy Spirit within us, we could continue the works of Jesus here on earth and invite others into God’s Kingdom for all eternity. I also believe that we are not meant to fully understand such mysteries this side of heaven and that the love story into which God has mercifully written me will sustain me because I believe that my name is forever written in the Book of Life.